Olivia Pope’s luxurious wardrobe, with all its cashmere layers and dramatic silhouettes, serves a much greater purpose than fueling “get the look for less” service journalism. Each outfit is a sartorial mood ring, and the quickest way to figure out what’s behind Olivia’s poker face is to see which cowl-necked tunic she wears from one scene to the next. In “Watch Me,” the first episode of Scandal’s seventh and final season, each of Olivia’s ensembles looks like it was inspired by some kind of funereal look book. To quote Jay Z, she’s in “all black everything,” which is fitting since she seems determined to deliver on the sixth season finale’s promise to intoxicate her with absolute power. “Watch Me” heralds the birth of a brand-new Olivia Pope, one far more willing to follow her darker impulses if she believes the ends justify the means. The episode begins with a whirlwind montage that confirms the death of Luna Vargas following Olivia and Jake’s intervention, as well as the ascendance of Cyrus Beene to the vice-presidency. Jake still has his cabinet position as well as his tenuous place in Olivia’s bed. With the same faces haunting the West Wing, the only real change in happening inside Olivia. For all her quixotic talk of white hats, gladiators in suits, and standing in the sun, her moral compass has never known true north. But this Olivia, the one splitting her time between running Mellie Grant’s West Wing and overseeing a reconstituted B6-13, isn’t a gladiator in a suit; she’s a bruiser in Balenciaga. When a member of Congress won’t agree to rubber-stamp Mellie’s newest legislative effort, Olivia summons him to her office to show him why she buys her manila envelopes in bulk. Suffice it to say, whatever is in that envelope is enough to get him onboard. Things are certainly different since Quinn Perkins and Associates hung their “under new management” sign outside the door. Without Olivia’s name lending credibility to this ragtag group of fixers, torturers, and spies, the business has been even slower than usual. There’s finally a break when QPA gets a walk-in: a woman named Madeline who is trying to figure out why her father, Joshua Stewart, a mild-mannered theology professor, went missing during one of his far-flung research trips. As it turns out, Joshua is a CIA asset who’s been captured by the government of Bashran, a hostile foreign power on the cusp of gaining nuclear capabilities. Jake, the cold-hearted pragmatist, tells Olivia the only way to deal with Stewart’s capture is to have him killed. It’s only a matter of time until the Bashranis push Stewart past his breaking point, Jake argues, so the only option is to sacrifice him rather than risk the exposure of other assets in the region. But Olivia refuses to go along with the plan. She says Stewart is an American hero who has repeatedly risked his life to keep the country safe, so killing him is a non-starter. As she mentioned earlier to the stubborn senator, this is Olivia’s world, and everyone around her is expected to follow her lead, including the president. When Jake makes an end run around Olivia, appealing directly to Mellie to authorize a surgical strike instead, Olivia could have chosen to give Mellie enough rope to hang herself with. Instead, she goes to the Bashrani ambassador and threatens to assassinate his son unless he makes a call to have Stewart escorted to the American embassy unharmed. 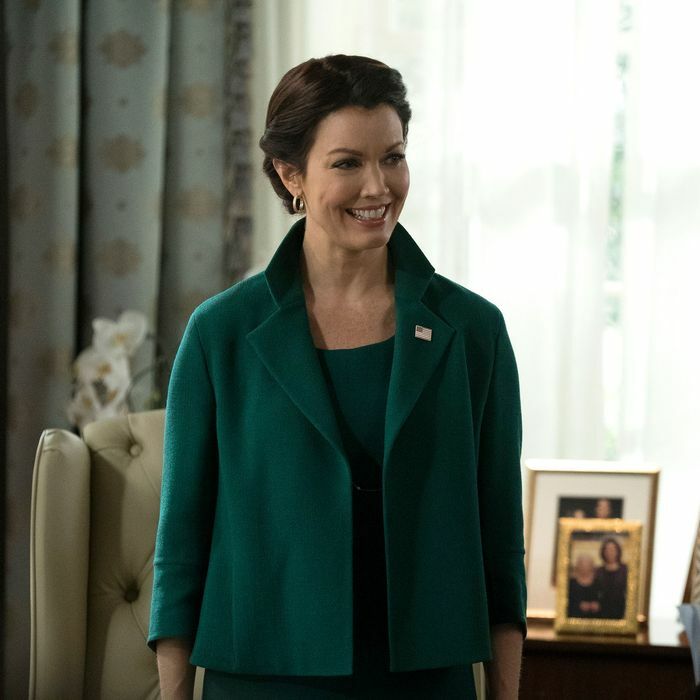 Mellie’s moment of relief is short-lived once she realizes that instead of coordinating the elimination of a potentially toxic asset, she has instead led the country into a diplomatic imbroglio. Meanwhile, Huck never gets the answer to his question about whether Olivia was serious about killing the ambassador’s elementary-age son if she didn’t get what she wanted. But it’s safe to say putting an actual sniper in place is a lot of trouble to go to for a bluff. • According to the closed captioning, the opening montage was supposed to be set to Tone Loc’s “Funky Cold Medina,” which would have been super weird. Swapping in Public Enemy’s “Fight the Power” was a wise choice. • Jay Hernandez joins the cast as Curtis Pryce, host of the prime-time cable crossfire show The Pryce of Power. Oh, and he’s also Olivia’s new sleepover buddy. • Speaking of new additions, Shaun Toub is a great addition as the Bashrani ambassador. He deployed the same scary intensity on Homeland, and he’d make a terrific antagonist for Olivia and Mellie.